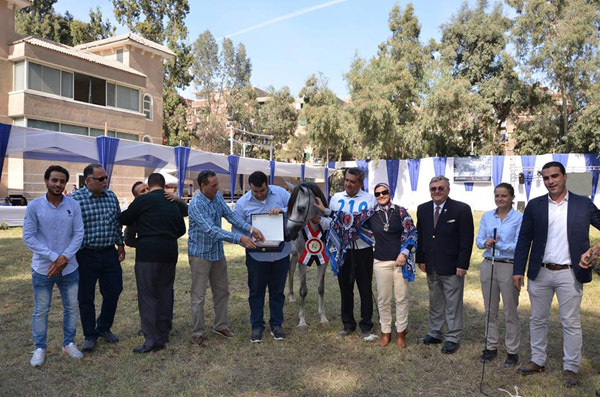 The Egyptian Agricultural Organization has awarded Egypt’s 2015 WAHO Trophy to the charming filly Heba El Bourini. Traditionally, the EAO has presented this Trophy to the female winner of the title ‘Most Classical Head’ at their annual National Championships Show. Whereas this filly was awarded Most Classical Head Female Trophy at the 2015 Show, she also deserved to be awarded the WAHO Trophy. Heba El Bourini admires her award with her delighted owner/breeder, Mr. Mohamed El Bourini and his family and friends, during the WAHO Trophy presentation by Peter Pond, WAHO President.